Xeniversity is having a grand opening tomorrow and you're all invited! I had the pleasure of checking out the sim today and it is so different from other furniture/prefab shops. The 'build' consists of a platform made up of cubes with platforms on different levels for you to shop in an open, unconfined space. There's already furniture and a prefab there, with promises of more to come soon. Here are some pictures I snapped in-world, totally un-retouched so you can see that the skybox will look exactly like it does in the vendor ad. All the shadows are baked onto he textures so it really does look like this once you rez it! For a box that is 22x22x12meters, it sure looks big! Here's a picture of me inside the loft skybox. There's plenty of room inside for furniture, or a studio or whatever you want to use it for. The open space is very versatile. Well, you know I can't do a blog post without a picture of me somewhere… 😀 I think this skybox is great for photographs. 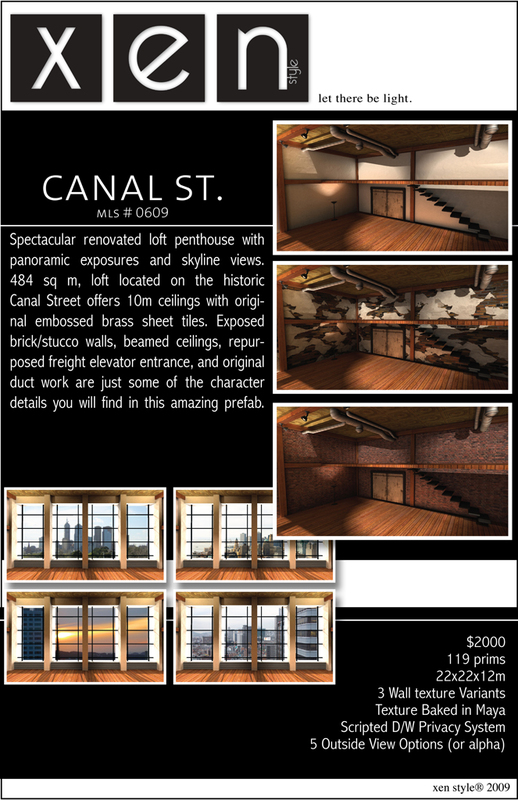 Here's a little tip for you guys reading this, if you can't wait to see the Canal St. Loft up-close; it is set for sale right now, even though the sim has not officially opened yet! Tp to Xeniversity. I am proud to annouce the Grand Opening of my new store XEN STYLE! My company's main focus is to produce the absolute highest quality in sculpted objects, skyboxes, prefabs, and furniture seen on the grid today. By utilizing dynamic lighting to bake and texture all of our products we are able to achieve some of the most dramatic spacial designs and concepts that have yet been attempted. We will be dedicating ourselves to make weekly additions to the product line to always remain fresh, including a huge new line of full perm sculpts that will be soon to follow. I see this as a chance to become a company that thrives on the needs and wants of our customer, in order to consistently deliver them the utmost in quality and service, with every product we are able to create. You are cordially invited to attend the opening of Xen Style! Freebies hidden around the island!